We’ve been tracking Los Angeles-based startup DocStoc for years now, from the company’s roots as a fairly broad document sharing site that competed directly with Scribd to, more recently, a hub that caters more exclusively toward businesses, complete with bundles of premium professional documents available for purchase. And today, the company is taking another step in that direction, with a rebranding of the site that positions it with the tagline, “We Make Every Small Business Better”. CEO Jason Nazar explains that for the last year the company has been building out a repository of professional documents — they have 20 million that were uploaded by users, and plan to have another 10,000 written in-house (or outsourced to contracted professionals) by the end of the year. The goal of this DocStoc-produced content, Nazar says, is to provide businesses with a set of documents — including hiring forms, schedules, and legal papers — that they can trust to be high quality, so they don’t have to wade through multiple variations of similar docs. This content is available through a premium subscription service, which runs $20 a month (if you buy multiple months at a time, the price goes down). In addition to creating its own documents, DocStoc is also increasingly producing articles and videos related to starting and running a business. And that’s just the start, Nazar says. Later in the year the company will be rolling out additional products to help streamline business management (as far as documents are concerned), including a wizard that will help complete forms quickly. DocStoc has been offering some of these features for several months now, and Nazar says that the startup already has “tens of thousands” of companies signed up for subscriptions. My gripe with the service: DocStoc includes disclaimers saying that it isn’t providing legal advice, so it isn’t responsible if you use a document the wrong way, or aren’t using the right documents, or whatever. 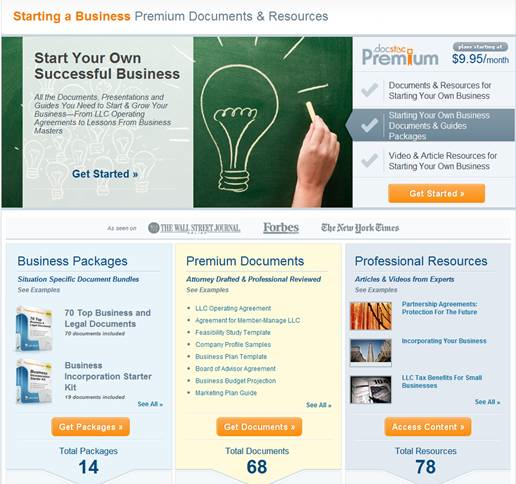 Nazar says that the majority of the site’s professional documents aren’t related to legal issues, and for those that are, the site will also be helping users connect with consulting services, so you can speak to someone (for a price) if you want to be sure you’re setting your business up the right way. And if you already know what you’re doing, then DocStoc could be exactly what you’re looking for. The company last raised $4 million in 2008 — it’s now profitable, with 35 full-time employees. Nazar says that revenue has been doubling each year for the last three years.